Just a bit more info so we can assist you best. What stage of planning are you in? Who referred you to Knowmad Adventures? Home to ancient civilizations, vast archeological marvels in unbelievable settings, vibrant indigenous cultures, and natural wonders spanning from unspoiled Amazon rainforest to towering Andean peaks, Peru inspires awe at every turn. Throw in diverse and delectable food and remarkably friendly people, and it’s no wonder why Peru is a traveler favorite. Below you’ll find some basic information about some of our favorite regions in Peru as well as some suggested Peru itineraries. Knowmad is a Peru travel expert, and we are happy to build a no-obligations custom trip proposal for you based on your regions of interest, or by combining a variety of suggested itineraries and customizing based on your preferences and style. Click for more information on the custom trip planning process or to design your trip today. Below are just a few of Knowmad’s favorite, hand-crafted travel itineraries. These trip ideas seamlessly blend Peru’s must-see highlights with off-the-beaten-path explorations all the while taking into consideration the best flow and pacing necessary to truly experience each region they include. These trips can be experienced exactly as described, or they can be used as planning tools and building blocks while you work with a Knowmad Trip Specialist to build your custom dream trip. Learn more about the custom travel planning process here. An ideal Machu Picchu trip including classic Peru highlights, while also venturing off the beaten path. An optimal Peru itinerary that includes hiking the Inca Trail. Knowmad avoids crowds, enjoys the best food, camps in privileged remote sites, enjoys a full day at Machu Picchu, and helps you arrive safely and in an environmentally friendly way. 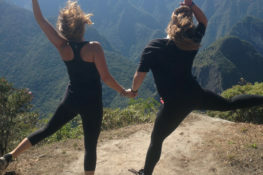 A more active approach with one day hiking the Inca Trail, biking or horseback riding, and unique cultural opportunities. The Peruvian Southern Andes incorporates Machu Picchu, Cusco, and the area connecting the two known as the Sacred Valley of the Inca, making it a highlight of nearly any Peru trip. Machu Picchu This incredibly vast archaeological site – lost to the world until well into the twentieth century – is perched amidst Andean peaks and lush cloud forest making it as breathtaking as it is intriguing. Arrive by train or by hiking on the Inca Trail. The Inca Trail Doing the pilgrimage to Machu Picchu may push you, will likely help you know yourself better, and will certainly be an amazing experience. Doing the Inca Trail with Knowmad means you’ll do it away from the crowds; that you’ll have charismatic, fun guides and meet unforgettable people along the way; and that you’ll do it all in style with great equipment and food. Multi-day hikes on alternative Inca Trails such as Choquequirao are also great options. Cusco Former capital of the Incan Empire, today Cusco is one of South America’s most dynamic cities. Cobblestone passageways lead you to some of the country’s best restaurants and fashionable shops, colonial cathedrals sit atop original Incan walls, and Andean people switch between the indigenous tongue Quechua and Spanish as ancient and modern worlds become one. The Sacred Valley Experience traditional cultures and customs in the Andes, wander the saltpans at Maras, explore the lesser-known major Incan sites of Ollantaytambo and Pisac, and visit vibrant markets as you enjoy this beautiful valley leading you to Machu Picchu. Hiking, mountain biking, and community visits are great full day excursion options. Hike hard by day and relax in total comfort by night. Knowmad's Lodge to Lodge includes two full days at Machu Picchu, two nights at Machu Picchu Pueblo Hotel, and the best lodge to lodge pricing. Hiking to remote Choquequirao, a site larger than Machu Picchu that sees only a handful of visitors daily, is the ultimate off-the-beaten-path Peru adventure. This is a fully private, guided trek. Do it now before they build a train! An itinerary created specifically for the Inca Trail trek. With Knowmad you will avoid the crowds, support a sustainable Inca Trail operation, and hike with the best guides, porters, and cook team. Knowmad suggests continuing directly to the Sacred Valley after landing in Cusco as opposed to spending your first nights in Cusco. The Sacred Valley is about 1,500 ft. lower than Cusco (about 11,000 ft), which helps you acclimatize more gradually and start your trip off on the right foot. Cusco is a great place to end your trip after visiting Machu Picchu. Spot wildlife and immerse yourself in the world’s most bio-diverse habitat while staying at a top-quality jungle lodge or cruising the mighty Amazon River. Great options out of Puerto Maldonado are just a short flight from Cusco, as well as out of Iquitos to the north. Much of Peru’s eastern and northern border areas are part of the Amazon Jungle. The area just east of Cusco (a 40-minute flight on a small jet to Puerto Maldonado) is defined as the Peruvian Southern Amazon Basin. Outside of Puerto Maldonado on the Tambopata and Madre de Dios Rivers are a variety of jungle lodges that offer good infrastructure from which to explore the Amazon. The proximity to Cusco and ease of travel make this area especially good for short stays of 2-3 nights. The Northern Amazon of Peru is reached by flying to Iquitos generally from Lima or Cusco. Here you have access to the Amazon River, which is why Amazon River Cruises such as the Delfin and the Aqua/Aria depart from here. Generally we recommend traveling to the Northern Amazon for cruises, or if the Amazon will be a more substantial part of your itinerary. The ultimate luxury Amazon River cruise - elegant and intimate, Delfin I and II get you up close to the Amazon's nature, wildlife, and cultures. Choose from a range of wildlife and adventure excursions by day and enjoy fine food and a private jungle cabana by night. Choose to spend three nights rather than two in the Southern Amazon Basin so that you’re able to have two full-day excursions in the jungle. Two night stays are fine, but as part of day one and three are spent traveling, visitors often feel they didn’t have enough time to explore. Call us today for more great advice and info on planning your Peru trip. Home to a variety of unique indigenous communities with strong traditions, the world’s highest navigable lake is surrounded by dramatic views of the Andes and the altiplano. Go by boat to the Uros floating reed islands, share a local meal on Taquile Island, or even kayak at 13,000 feet and stay at a small family guesthouse on these remote islands as you explore the cradle of the Incan civilization. Commonly referred to as the “highest navigable lake in the world,” Lake Titicaca is revered locally more for the fact that Inca and pre-Inca civilizations have long regarded the area as the birthplace of Sun God, one of their most important deities. It is thought to be the birthplace of their religion. Today it is one of the best places to see a variety of unique indigenous cultures with ancient traditions still in tact. The lake contains a variety of islands that are each home to its own unique civilization. Taquile remains relatively untouched by ‘modernity’ and welcomes travelers to partake and learn of their traditions. The Uros Islands are a loosely knit group of islands made from harvested reeds, and literally float atop the lake. Now many of these artificial islands are maintained mainly to service tourists, however Knowmad has relationships with some of the farther flung and authentic Uros. Amantani is another important and interesting island to visit. Isla del Sol and Isla de la Luna are accessed generally from the Bolivian side of Titicaca. For those interested in remote indigenous cultures, Titicaca is a must. Kayaking atop the world's highest lake, a unique cultural experience staying alongside a local family on Isla Taquile, and a visit to an authentic floating Uros Islands makes this extension unforgettable. Colorful cultures, with rich traditions, amongst scenic beauty, on the world's highest navigable lake, make Lake Titicaca a perfect extension to your Machu Picchu trip. Traveling to Titicaca by VIP bus from Cusco saves you money, is a comfortable and extremely beautiful journey, takes no longer than a plane when factoring in time at the terminal, and does not suffer from delays and cancellations such as the unreliable train. Arequipa The second largest city in Peru, Arequipa may very well be it’s most handsome. It retains its historic elegance, best personified by the town’s central plaza. It is simply a great place to sit park side at a café and watch Peruvian life unfold in front of one’s eyes. It also is the place where Southern Peruvian cuisine, one decidedly its own, is best highlighted with a great range of restaurants. Colca Canyon 102 miles north of Arequipa lies the Colca Canyon, which Peru’s most famed novelist Mario Vargas Llosa dubbed “The Valley of Wonders.” The canyon itself is over twice as deep as the Grand Canyon, and is a highlight in one of Peru’s most scenic regions filled with towering snowcapped volcanoes, narrow gorges, and arid desert landscapes. Be sure to try rocoto relleno, a meat-stuffed sweet and slightly spicy pepper variety found in the region. And don’t forget to request salsa rocoto, a condiment sauce made from the pepper, with dishes while dining in Arequipa. These trips combine the best of multiple regions or countries in just a short amount of time. Have more time? Consider working with a Knowmad Trip Specialist to combine elements of full-length trips from a variety of regions to create your own custom multi-region trip. Ideal active Peru trip that visits the Amazon in addition to a day hike on the Inca Trail, biking or horseback riding, and unique cultural opportunities in just 9 days. SOUTHERN ANDESMost trips in Peru center around the Peruvian Southern Highlands where Machu Picchu, Cusco and the Sacred Valley are found. Throughout the year the average temperature around Cusco and Machu Picchu is in the mid-50s °F (10-12 °C) and does not fluctuate greatly. Evenings are cooler. There are primarily two seasons: wet and dry. December through March sees much more precipitation than other times of the year and is the less visited season. AMAZONThe Amazon Jungle is, quite predictably, hot and rainy. When it rains it rains hard and moves on quickly. Average daytime temperatures are generally in the mid o high 80s F but can get into the 90s. Humidity guarantees it will almost always feel hot, but this is certainly part of the experience! Prior to your departure, we provide you with a detailed pre-trip information packet, which includes a recommended pack list, information about the regions you’ll be visiting, suggested readings, and up-to-date health information including any recommended vaccinations. You can also visit our frequently asked questions on Peru. Begin in Buenos Aires, then venture to Northern Patagonia’s idyllic Lakes District and Southern Patagonia’s stunning mountains, glaciers, and authentic estancias, and end at incredible boutique vineyards in this comprehensive Argentina adventure. You and your team did such a wonderful job and I can’t thank you enough. Our guide, Celinda, was incredible, extremely knowledgable and passionate about the Andean people and the Incan culture/ruins. We learned more than I could’ve imagined to. We loved the picnic, the climb up Waynapicchu, Machu Picchu and the ruins tours, the cooking class and the trip to the Amaru community!